I am perhaps a bit slow to catch on with this app. *E* has had it for ages and still gets a giggle out of it. Though the odd swear word creeps into hers now. It still shocks me that I have a nearly 15 year old in the house, and will soon have two children at secondary school! *J* has a tutor day tomorrow at *E's* school. He is most looking forward to taking a few pounds for lunch rather than a packed lunch (they call them 'pack ups' here btw). 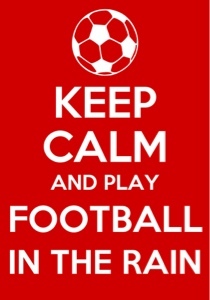 A third cricket match has been cancelled for tonight but *J* isn't so disappointed about that one because he has football training tonight now... in the rain! that app is very popular here! mostly we keep drinking tea and eat cake!